How About A Quickie For Two? If anything positive can be said about our concurrent energy and economic crisis, it might be that they’ve engendered the design of a few homebuilts that are a bit more accessible to the builder of today’s financial and technical resources than those of a few years ago. Where some of the popular homebuilts used to be fairly complex aircraft that approached not only the performance, but in many cases the complexity (and price!) of their factory-built counterparts, more recent ones have tended toward small size, light weight, simplified and sometimes unorthodox construction techniques, and sometimes even non-aircraft powerplants. This whole idea, of course, has always been attractive to would-be home builders - just look at the immense interest in the (unsuccessful) BD-5. However, if, in turn, anything positive can be said about the BD-5, it’s that it (a.) brought lots of new homebuilders into the fold, and (b.) started Burt Rutan on his career as a major figure in the homebuilt world. Air Progress has covered his exciting projects in great detail: the VariEze, the Defiant, and - most germane to this article - the Quickie. If you’ll cast your minds back to our July, 1978 issue, you’ll find that this is a tiny (230 lb empty) single-place ship, powered by an Onan industrial engine of sixteen or eighteen mighty horsepower. Small, light, safe, cheap and easy to build, and incredible fun to fly, the Quickie has already become immensely popular in a little over two years, with some seventy-five already flying and 550 more under construction. Why not, indeed? What with the spiral in aircraft and fuel prices, a whole new stratum of homebuilders was appearing: people who weren’t necessarily in love with homebuilding per se, but saw in it a way to get an affordable traveling machine that was simply unavailable any other way. For such folks, a two-place Quickie would be ideal; small, cheap and easy to build, and hopefully powered by an affordable non-aircraft power- plant—just like the single-place. 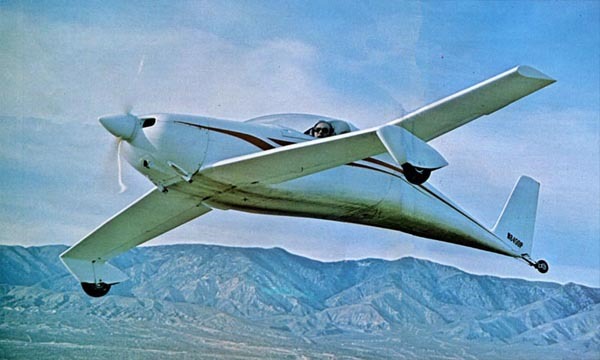 It would be easy to say that building a two-place Quickie was simply a matter of splitting a regular one down the middle, splicing a plug into the fuselage, and hanging on a bigger engine. Needless to say, that wasn’t the case, and the Q2—while looking as though that’s all that was necessary - is an entirely new aircraft. It’s somewhat different in spirit, too: where the original is, frankly, somewhat underpowered and very docile - an ideal first aircraft for an inexperienced flyer - the Q2 is definitely a performance machine, with higher takeoff, cruise, and landing speeds and a much higher power-to-weight ratio. VW conversion with dual ignition. 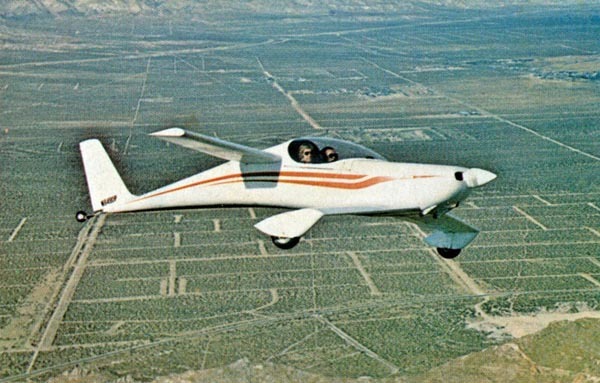 The prototype Q2 was constructed in Canada by Garry LeGare at his Leg-Air Aviation, Ltd., facility in Langley, British Columbia. After some months of work by Garry and his gnomes, not to mention numerous consultations with Tom and Gene back in Mojave, the ship was ready for its first flights at Abbotsford, B.C. It was subsequently brought to Mojave, as was Garry, and after a short period of adjustment to a place where the ground isn’t covered with snow, both are doing well as further test flights and envelope expansion work continue (Garry, of course, sometimes continues to mystify locals with Canadian exhortations such as, “Alors, shootez-vous le pucque, dere, eh?”). As for the airplane itself, it looks enough like the Quickie to be mistaken for it from a distance, especially if seen from the side. There’s the same dragonfly arrangement of a large canard with the main gear in front, and a smaller wing with inboard ailerons just aft of the canopy. In the Q2, the amount of weight carried by the canard is proportionally greater than that of the Quickie. One immediate difference is evident as soon as the engine is started. Actually, it’s evident even before the start: while the mighty Onan in the Quickie had to be jerked to life by hand, the new engine has an electric starter. Once running, it even sounds like an aircraft engine, rather than like a lawnmower. The new powerplant is a Revmaster conversion of the large 2100cc Volkswagen engine. In its most highly- tuned form, and with a turbocharger, this unit produces some eighty-five hp; in the Q2, normally-aspirated, it’s derated to sixty-four hp for increased engine life and reliability. Even so sixty-four hp is a good deal of power for an aircraft that only weighs 1,000 lbs at gross weight, and cruise speeds in the 165 to 180 mph range can be expected. Adventurous souls may well want to try the blown version; several - among them Garry LeGare himself - have them on order with the little Maloof constant-speed prop. My introduction to the ship was a bit more comprehensive than the standard pilot report: since I’d done the spin and flutter test flights on the original single-place Quickie a couple of years ago, I was asked to repeat the performance this time around. Garry must have wondered why they ever chose me, since I immediately demonstrated my expertise in taxiing, before I ever got to fly, by getting a bit enthusiastic on the somewhat grabby heel brakes and standing the ship up on its nose—much to the detriment of the wooden propeller. No further damage occurred, however, and a new pop was installed in half an hour or so. So what’s it like? Entry is over the left side, since the big canopy swings up to the right, just like in the single, seating position is just about the same, i.e. semi- reclining. Where the single-place has a little sidearm controller on the right armrest, Q2 has a similarly tiny stick between the seats, so the right-seater will be flying left-handed. 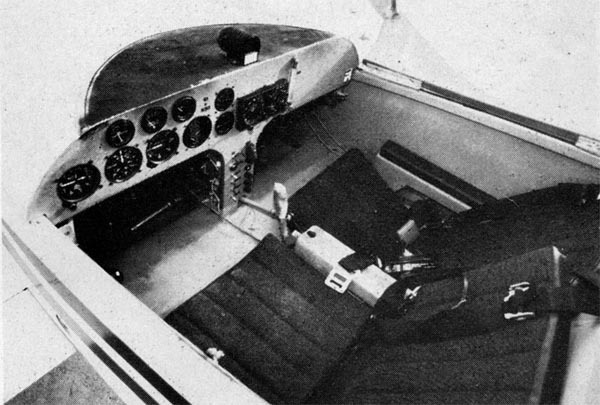 On the prototype, throttle and rudder pedals are provided on the left side only, although of course they can be dual on homebuilts if desired; frankly, with the inboard ailerons on the main wing, there’s almost no adverse yaw, and if the second pilot is there mainly for relief on long trips, stick-only flying from the right is more than adequate. Fuel is carried in two tanks, a main under the seats and a feed tank above the engine and behind the instrument panel. Two electric pumps—either of which can handle the job alone—continually feed fuel from the seat tank into the feed tank, with the excess returning to the seat tank. An electric fuel gauge indicates seat tank quantity, while a sight tube shows level in the feed tank. Even if both electric transfer pumps were to fail, the fuel in the feed tank allows about an hour’s flying time. Q2's instrument panel has plenty of room for "light IFR"
similar to the Cessna 172's. The Q2 uses a POSA “FUEL INJECTOR” carburetor - a single - throat affair that works very well when the engine is running, but dribbles fuel continually if the mixture is anywhere but at idle cutoff with the engine stationary. Thus, all starts, hot or cold, are done by cranking the engine with the mixture all the way back after an initial prime, then catching the engine as it fires. I tended to load the engine up on the first few tries, but soon got the knack of it, even though the starter on the prototype was a bit anemic and could only crank one blade at a time (a different type will be used on subsequent ships). Taxiing the Q2 is very similar to the same evolution in the Quickie, with one important difference: where the brakes on the Quickie were nugatory in effect, those on the Q2 are extremely powerful - so much so, in fact, that their effectiveness will be reduced in future aircraft to avoid embarrassing incidents like mine. At the same time, the current heel brake arrangement will be changed to a more common toe brake type, although actuation will still be mechanical, rather than hydraulic. The tailwheel is steerable but does not caster; even so, if absolutely necessary, very tight turns can be negotiated by gingerly getting on one brake at low speed, which simply skids the tailwheel sideways. There are only a few pounds of weight on the tail at present; in later airplanes, the main-gear axles will be moved forward just a bit to improve ground handling. Once at the runway, there are the usual pre-takeoff checks. On the Quickie, if the engine was running you knew the single mag was operational; now you have two to check. At present the trim system is a hand- wheel near your left knee, but it’ll be modified to a pushbutton (non-electric) type like those on some sailplanes. There’s no rudder trim, so a last look around to make sure the fuel pumps are on, and we’re on our way. Acceleration is quite rapid, with the Revmaster/VW winding up to 2,800-3,200 rpm depending on whether the intrepid test pilot has earlier ruined Garry’s favorite propeller or not. Liftoff is in a level attitude at around sixty-five KIAS, and the climb is immediate and gratifying compared to the stately ascent of the Quickie. Best rate of climb comes at around eighty KIAS, but allowing the ship to accelerate to 100-110 doesn’t cost much in climb and provides much better viz over the nose, not to mention better cooling as well. Alone in the airplane with about three-quarter fuel, I consistently saw better than 800 fpm through 7,500 feet, and better than 500 fpm through 11,500. The Q2 shares the Quickie's resemblance to a "Star Wars" fighter. Control feel in the Q2 is very pleasant and well-harmonized; the forces are such that the minuscule center stick - which is hinged just below the grip, and which in Garry’s ship is wrapped in padding and dirty white gauze that makes it look like a large bandaged thumb—is pleasantly light almost all the time. The exception, and a very good one, appears when you approach V1 (which falls at around fifty-seven to sixty KIAS): the last few degrees of elevator travel require a definite increase in pull force, which will help prevent inadvertent “stall” (I use the word in quotes since the Q2’s canard design precludes a real stall; the canard loses lift before the aft wing and is thus unable to pull the latter beyond the critical angle of attack). As it is, the ship isn’t quite as viceless and “idiot-proof” as the Quickie, but then it isn’t meant to be; even as it is now, it’s entirely manageable for a pilot of average experience, and once a few minor changes have been made (see the sidebar on handling qualities’) it should be even nicer. going to be reduced on the later Q2's. Throughout the flight envelope, visibility is first- rate. 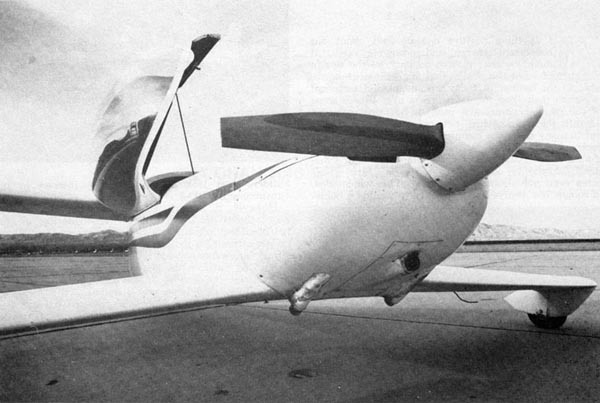 The main wing is behind the cockpit and out of sight unless you really swivel your head, and the canard, while fairly large, is far enough below eye level so that it doesn’t intrude on your vision. In fact, I imagine a tinted canopy will be among the more popular options among kit builders from the sun belt. Let’s talk about the kit for a moment. 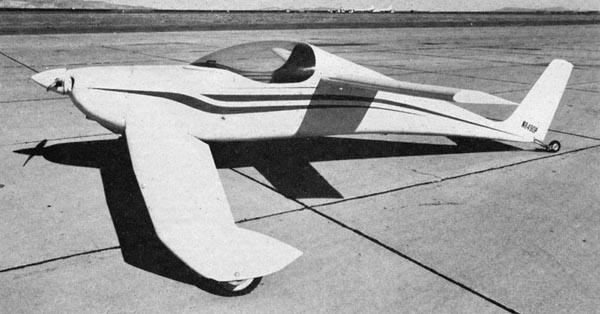 The prototype—named “Fatso” by Garry LeGare—was assembled along the usual foam-core and fiberglass-skin lines. The kits will be, too, but much labor will be saved— not to mention around thirty lbs of empty weight—by the inclusion of preformed glass-over-foam fuselage shells. The first specimen had just come out of the mold when I was doing the test flying, and looks terrific. Empty weight of a complete Q2, including full electrical system with starter and a fire extinguisher (they’re required in Canada) should be right at 500 lbs—or half of gross, which translates to a pretty efficient machine. The Q2’s higher wing loading makes it a bit more convenient, it can descend with considerable alacrity on final, and in fact requires just a bit of power for a comfortable approach at around eighty KIAS, with seventy-five KIAS over the fence. There’s lots of “flare power” available for a soft touchdown; with the CG anywhere forward of about mid-range you’re most likely to arrive on the main gear first, with the tail coming down a couple of seconds later. The prototype has somewhat more rudder area than later ships will have, so the pedals have to be treated with a bit of respect, as do the brakes. Crosswinds? No problem - after all, the ship can fly at a steady thirty degree sideslip angle, which should take care of any reasonable situation. I will not be at all surprised if the Q2 is as much of a success as the original Quickie. It is, of course, a more ambitious project all around, and at a more ambitious price ($9,345 gets you everything - and I mean everything - but paint and the battery); but for that, you’ll end up with a pretty ambitious aircraft, with performance rivaling that of the four-place retractables, and panel-size and weight capabilities for “light” IFR flight if you want. The Q2 should be, if anything, even easier to build than the Quickie, what with its preformed fuselage shell. In fact, we should soon be seeing Q2s popping up at airports all over the country—and a few of them won’t really be Q2s! The basic “Quickie-style” design is such a good one that another clone—the Dragonfly— has also emerged from the chrysalis, and it looks as much like the Q2 as the Beech Skipper resembles the Piper Tomahawk. Needless to say, we’ll cover it in a future issue; in the meantime, suffice it to say that the Q2 is a worthy successor to the Quickie, and both should continue very popular in coming years, on their own merits as well as due to the ever-increasing costs of airplanes and gasoline to run them. 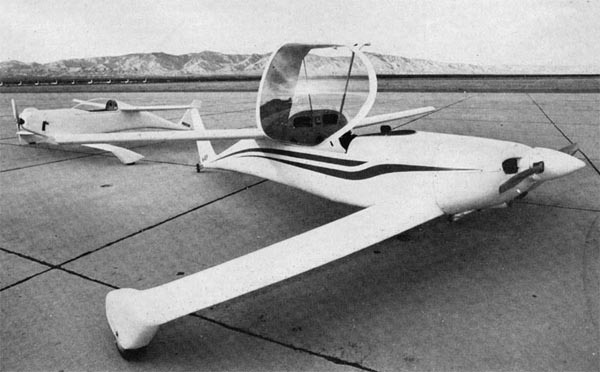 This is a very small two-place aircraft of canard configuration. It is powered by a “Revmaster” modified Volkswagen engine driving a tractor propeller. Seating is side-by-side and semi-reclining, with a small central control stick and conventional rudder pedals. The landing gear is of conventional type, with the main wheels mounted in fairings at the tips of the canard surface and the tail wheel on a tubular spring behind the aft fuselage. The mechanically-activated main wheel brakes are extremely sensitive and powerful; the geometry of the heel- brake pedals is somewhat awkward. On this pilot’s initial taxi, excessive brake application resulted in the airplane’s “nosing up” and coming to rest on the propeller hub, lower surface of the nose cowl, and main landing gear. The propeller was destroyed and the engine air intake tube slightly distorted; there was no engine damage. The first flight was made at a mid-CG location for general flying qualities assessment. Liftoff occurred at approximately seventy KIAS with neutral elevator and in a level attitude. Climb speeds between eighty and 110 KIAS were used to an altitude of 10,000 ft MSL. Controls are light and positive about all axes, with the rudder considerably more effective at full throw than ailerons or elevator. The aircraft shows strong positive stability about pitch and yaw axes, and essentially neutral roll stability with considerable dihedral effect. Climb was continued to 12,500 ft MSL for a series of power descents for flutter investigation. Speeds were increased, initially in five-knot and subsequently in one-knot increments, to a final value of 180 KIAS at 10,000 ft MSL. Controls were excited in all axes. 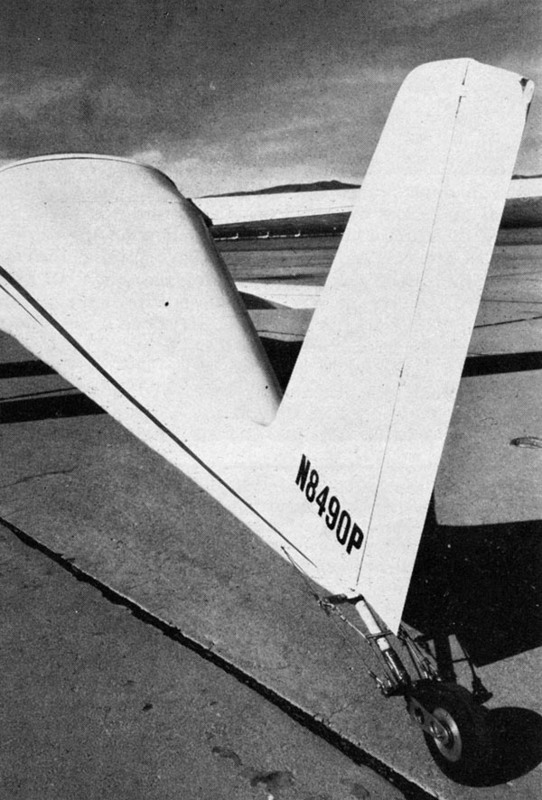 Ailerons and rudder returned to neutral within one beat at all speeds. Elevator surface also returned to neutral in one beat; however, at indicated airspeeds in excess of 145 KIAS, very brief residual oscillation of the entire canard surface was noted, with a period of approximately 0.1 second an initial amplitude of approximately one cm, damping out completely within three to four cycles. No evidence of elevator coupling was noted; however, this is an area which would bear further investigation before the Vne envelope is further extended. At airspeeds above 135 KIAS, pitch trim forces become initially neutral, then slightly reversed, such that stick-free pitch stability becomes slightly divergent. While this does not represent a true handling problem, since stick-fixed stability remains excellent, it could cause operational difficulties and possible PlOs, particularly for inexperienced pilots. The “tuck” experienced when the stick is released is mild (approximately two KIAS/sec or less) and easily controlled. Increased pitch bungee rates may be required to eliminate this tendency. The aircraft was then slowed for assessment of flying qualities near and at Minimum speed attained, with and without power, was fifty-six KIAS; it should be noted, however, that a large airspeed position error is present at high values of alpha. Vmin can be attained with slightly less than full elevator deflection. Beyond approximately seventy-five percent elevator deflection there is a marked and nonlinear increase in required stick force. If is maintained with only required elevator deflection the aircraft is stable about all axes. Increasing elevator deflection to the maximum available results in the onset of separated flow over the canard, with characteristic pitch oscillations of ± three to five degrees and a period of approximately .5 seconds. A slight “dutch roll” tendency is evident, diverging initially and then stabilizing at ± ten degrees. This tendency is more evident with power off. Rudder deflections are initiated at and resulted in a roll-off in the direction of rudder application. As the sixty-degree point was reached, the nose dropped below the horizon despite continued application of full up elevator, and had reached approximately thirty-five to forty-five degrees nose down, with airspeed increasing to 125 KIAS and g increasing to approximately two, after 360 degrees of rotation. Similar maneuvers were entered from a cross-controlled condition. The rudder is considerably more powerful than the ailerons, such that as airspeed decreases rudder deflection becomes the determinant of the subsequent flight path (roll-off). The dutch rolling tendency is considerably more pronounced and appears to be more divergent, increasing at some five degrees per cycle and reaching ± twenty degrees by the end of the fourth cycle, at which point the roll-off occurs. Recovery from any of these maneuvers is immediate upon slight reduction of back pressure. Secondary stall phenomena were not encountered. A second flight was made with the aircraft ballasted for a more forward cg location. Performance and handling were similar; however, the tail tended to lift first on takeoff, and landing was made on the main wheels rather than in a three-point attitude. With the tail in the air, the aircraft is directionally sensitive due to the effective rudder. Use of brakes was avoided until reaching taxi speeds. Rudder roll-off maneuvers were entered from coordinated and cross-controlled flight in both directions and were found essentially similar to those at a mid-cg location. The pitch oscillations and dutch roll tendency at Vmin were slightly reduced. For a third flight, the aircraft was loaded to a CG location approximately seventy-five percent of the aft limit. Once again, rudder rolls were initiated in both directions from normal and from cross-controlled flight and allowed to develop through 360 degrees of rotation. Handling and pre-”stall” indications were virtually indistinguishable from those at mid-CG location, with a very slight increase in dutch rolling before the roll-off, and slightly less airspeed gained by the end of one complete rotation (120 KIAS). 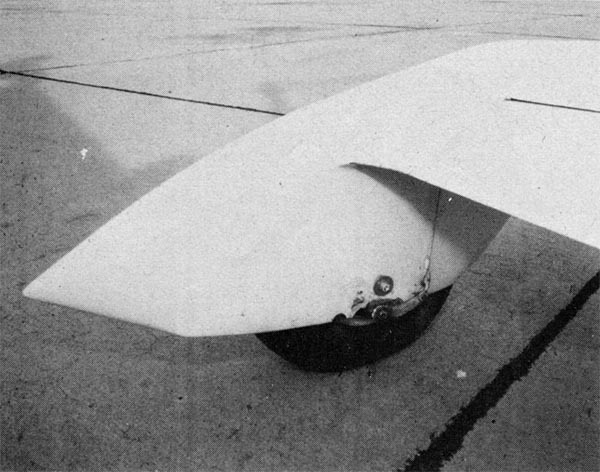 Aileron rolls were performed both to the left and to the right, with entry speed of 135 KIAS and initial pitch pull to approximately twenty degrees nose up. Finally, the aircraft was ballasted to a cg location representing slightly aft of the current aft limit, and rudder rolls were performed at Vmin. This was the only condition in which there was any indication that a true departure from controlled flight might be possible: rotation rate tended to increase during the roll-off, and was still increasing at the end of 360 degrees of rotation; the nose remained well below the horizon, but there was less of a ‘nose dropping” tendency than at more forward CG locations. Dutch roll before roll-off was considerably more pronounced and more divergent. This pilot would suggest incorporation of a jettisonable canopy and some means of relocating CG forward inflight, as well as somewhat more comprehensive instrumentation (angle of attack and sideslip vanes, elevator-position indicator, g-meter) before further exploration of HAAG regimes (High Angle of Attack Gyrations) at and/or beyond present aft-CG limits. In current configuration, the aircraft has a very effective rudder as well as strong dihedral effect. Application of rudder at or near Vmin results in a strong rolling moment in the direction of rudder deflection, with a subsequent spiral dive with rapidly increasing airspeed. Recovery can be effected by reduction in back pressure, rudder deflection, or both. It is suggested that further tests be carried out after the aircraft has been modified for easy egress, starting initially at forward CG locations. These tests might include investigation of developed rudder rolls—it is the conjecture of this pilot that a steady state should develop after two or more rotations—and attempts to reverse rotation with rudder only, an area which might reveal hitherto-unsuspected departure tendencies. A “falling leaf” type maneuver could also be explored. Reduce maximum nose-up elevator deflection by ten percent; will still be attainable, without the pitch oscillations and dutch roll characteristic of maximum- deflection flight at present. Eighty percent of current elevator is still within the region of increased stick forces, which I consider a valuable safety feature. Reduce maximum rudder deflection by thirty percent. At present, the aircraft can maintain steady-state sideslip angles approaching forty-five degrees—but at bank angles that would preclude a successful crosswind landing. Thirty degrees of sideslip capability should be sufficient to handle all reasonable crosswinds. Move the main wheels forward one or two inches, and make the brake response more linear with respect to pedal pressure. Examine improved pedal geometry. Install an improved trim system similar to that found on certain Glasflugel sailplanes to increase stick forces at high speeds, reduce PlOs, and reduce the current reversed trim situation at high speeds.